Get your "Little Witch" on with the Witch's Brew votives and charge up your Inner-Witch! 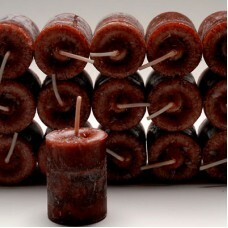 Give a boost of power to your witchyness with a votive size pop of energy. The recipes come from our personal spell casting experiences blended with sumptuous scents to create products that are chock full of witchy goodness. The gorgeous scent of the Witch's Brew has to be experienced at least once in your life. Made with exotic magical oils such as Dragons Blood, Mugwort, Frankincense and Myrrh, this candle helps focus and intensify your magic. Each pillar is labeled with inspiring words in an empowering spell. Dont worry; we leave lots of room for your own crafting touch. A blood red candle with dragon’s blood fragrance. Box of 24, each votive burns for 10 hours. 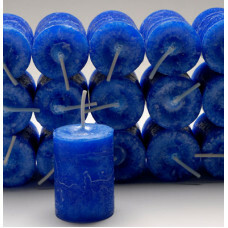 S..
A brilliant blue candle with a juniper and rose scent. Box of 24, each votive burns for 10 hours. 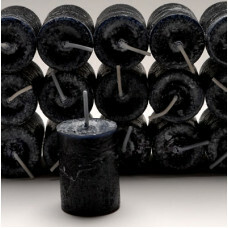 A ..
A witch's black candle with the perfect magical resin essential blend. 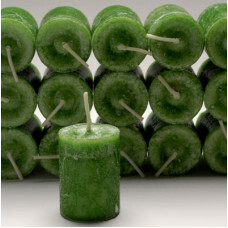 Box of 24, each votive burns ..
A prosperous green candle with a sweet rich essential blend. Box of 24, each votive burns for 10 hou..